Our solid board is the ideal material to package fresh fish, round fish and salmon. It is an environmentally friendly and sustainable alternative to the usual polystyrene and plastic crates. After all, solid board is 100% recyclable and made from renewable resources. 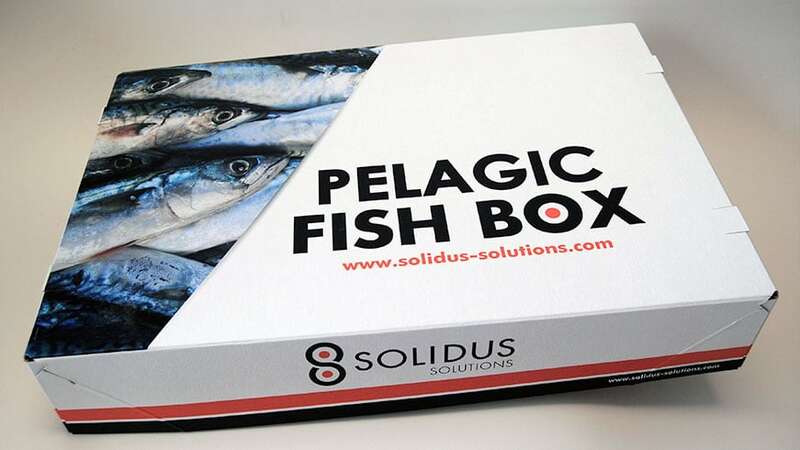 We have many solid board packaging solutions for pa­cking fresh fish. Our 400x240x70 mm box is ideal for packing small fish like sea bream, trout, halibut, sardines or pollock. These 3 kg boxes offer a great, 100% recyclable alternative to polystyrene or plastic crates. The packaging takes up to seven times less space than polystyrene boxes, minimising shipping costs and reduce in your storage space, also using the most optimal palletizing. We also supply a range of fresh fish packaging for 5-6 kg. The formats 370x275x110 mm and 570x180x140 mm are available for this. Our 5-6 kg boxes can be used for fresh fish like cod, carp and tench. Our solid board can be supplied with a moisture protective layer, providing insulating, moisture resistant boxes, making them suitable for humid and cooling conditions. Also a 10 kg fresh fish, recyclable solution is offered by us. The size 570x370x140 mm is ideal to use for large fish like salmon, turbot or for shellfish like lobster. Our Sapino®-treated solid board with PE coating offers the required insulation for packaging your fish, making sure the fish stays fresh during transport and storage. Besides our standard formats, we also supply many other solutions for packing diffe­rent types of (shell)fish like toothfish, snapper and shrimps. We offer a full range of solid board packaging for packing different types of round fish. Our 590x390x115/105 mm box is ideal to use for packing 20 kg of round fish like mackerel, hering and horse mackerel. These 20 kg boxes offer a great, 100% recyclable packaging solution. 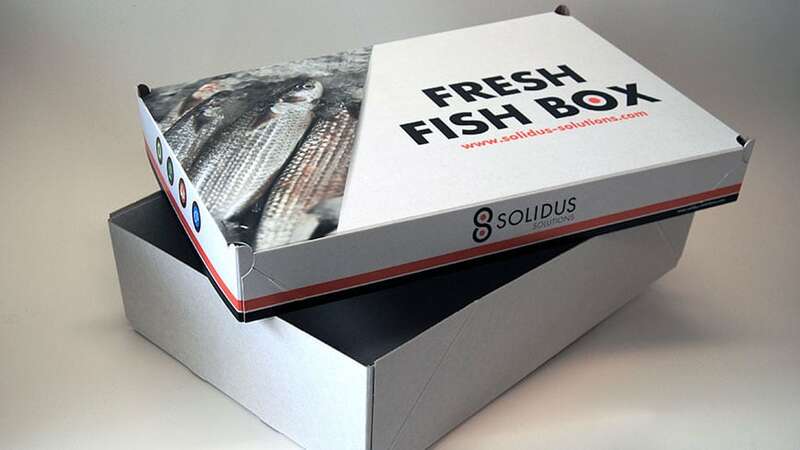 Fish packed in solid board packaging can be fro­zen immediately. Your product also freezes much faster when packed in solid board. Solid board is compact and offers attractive logistical advantages, maximising storage whilst minimising transport costs. We supply different sizes and formats of 4 point glued solutions for packing 5, 10, 25 and 40 kg salmon. Our smart salmon designs offer attractive prin­ting in ecological material which is perfect for humid and freezing conditions. In this way your product will receive the attention it deserves. Besides that, we also have a beautiful display solution for prepackaged salmon. The packaging can be used both as a display and as transport packaging, performing a multifunctional solution for you as customer. This type of packaging can be directly placed into the shop and has the possibility to be further personalized with a nice design or print. 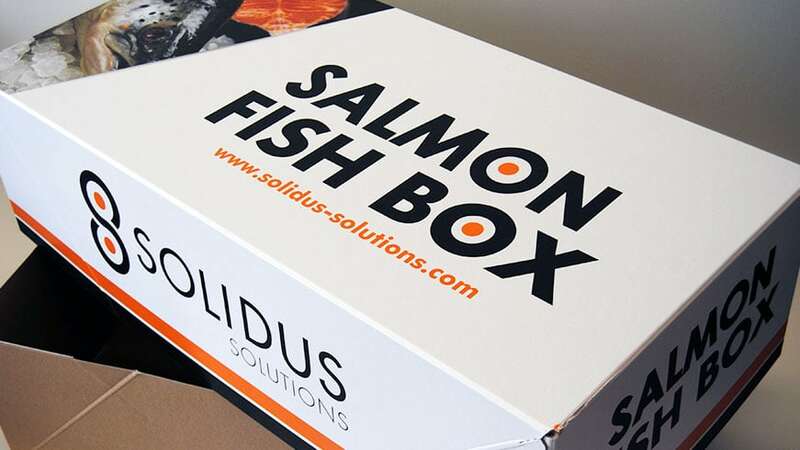 In need for fish packaging solutions? Our FOODLINE has been especially designed for food packaging, including packa­ging for salmon.